The Miramichi Salmon Association offers a major scholarship for salmon research in honour of its long time former President, Jack Fenety of Fredericton. The “Jack T. H. Fenety Conservation Scholarship” is made available each year to a selected graduate student attending a university who is conducting meaningful research about wild Atlantic salmon and/or its habitat which will have relevance for the Miramichi watershed. 2018 is the sixteenth year this scholarship has been offered, and we are pleased to announce that Mr. Jani Helminen, PhD candidate at the University of New Brunswick, Fredericton, NB is the recipient of this award. 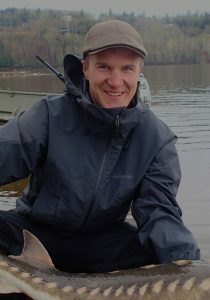 Mr. Helminen’s work is entitled Salmon Population Assessments using ARIS Sonars. His project is part of the Collaboration for Atlantic Salmon Tomorrow (CAST) program. First recipient of Jack T.H. 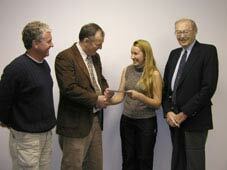 Fenety Scholarship given to UNB gradaute student Ms. Cindy Breau in 2003. The Miramichi Salmon Association is a conservation group focused on the preservation and enhancement of wild Atlantic salmon throughout its spawning range, and especially in North America’s most abundant Atlantic salmon river, the Miramichi. The MSA, established in 1953, has as its mission statement: management actions to optimize the population of juvenile salmon stocks in the Miramichi River. It is directly involved in collaborative research and management initiatives to benefit the Miramichi River and its Atlantic salmon resources. Financial support for the MSA comes from the volunteer efforts and contributions of its members and sponsors both in Canada and the United States. The Miramichi Salmon Association has established the “Jack T. H. Fenety Conservation Scholarship” to support research related to Atlantic salmon in the Miramichi River. Scholarships are made available annually to a graduate student conducting research associated with the ecology of Atlantic salmon that would be relevant to the Miramichi River. Research projects should address current issues of the day, which will lead to a better understanding of the relationships between Atlantic salmon and its environment in order to minimize the impacts of human activities and to enhance the abundance and sustainability of the Atlantic salmon resource. The Miramichi Salmon Association maintains a fully operational salmonid culture and research facility with accommodations at the Miramichi Salmon Conservation Centre, with flow-through and re-circulation systems in support of research activities. The Centre is located on the banks of the Northwest Miramichi River at South Esk, New Brunswick and applicants that plan to utilize this facility will be given priority. The scholarship is for a student conducting graduate level research at a Canadian or American university. One scholarship per year valued at up to $10,000 CAD will be awarded. The funds will be disbursed directly to the student and may be used for the purchase of equipment and materials, for travel expenses during fieldwork, and as a living allowance. The funds may not be used to defer administrative fees or other costs with the university, government, or private collaborators. Multi-year proposals will be considered, however, funding is on an annual basis and the second year’s money would have to be applied for according to the regular funding schedule. The consequences to multi-year research must be identified if only one year of funding is provided. Areas of research must involve the Atlantic salmon and provide knowledge that will assist the Miramichi Salmon Association in delivering its mission of management actions to optimize the population of juvenile salmon stocks in the Miramichi River. Relevant research topics include, but are not limited to, aspects on carrying capacity of habitat, inter-stage survival rates, constraints on production, effects of competition, predation at various life stages, the consequences of stocking juvenile salmon and ways to improve stocking strategies. The research can extend into the estuary as it relates to the survival of smolts or adults, but is not intended for marine research. The work does not necessarily have to be conducted on the Miramichi, but must be relevant to the Miramichi and the objectives of the MSA and priority will be given to work carried out at the Miramichi Salmon Conservation Centre.. The Miramichi Salmon Association hopes that some of the research may be conducted in association with the Miramichi Salmon Conservation Centre at South Esk, New Brunswick. Applicants are also encouraged to seek collaborations with provincial and federal governments, private industry and conservation groups. A brief interim report describing progress to date is required in July of the funding year, before the second payment is released to the researcher. A final report summarizing research conducted, results and conclusions from the research must be submitted to the Miramichi Salmon Association within the 12-month period of funding. A hold-back of 10% of the scholarship will be provided upon receipt of the final report. A financial report is also required describing how the funds were used in the conduct of the research. The Miramichi Salmon Association anticipates that much of the research sponsored under this scholarship fund will be published as university theses, refereed journals and in other publications. The MSA requires that its financial support to the research be acknowledged in such publications and that copies of the publications be provided to the MSA office. Research priority: Does the proposal address a research topic consistent with the mission statement of the MSA? Will the applicant use the facilities at the Miramichi Salmon Conservation Centre (tanks, apartment, artificial stream channel)? Research quality: Are the proposed methods adequate to meet the objectives of the project in an efficient and cost-effective manner? Are the planned expenditures reasonable? Funding: Are there other funding sources committed to the project? For more information on the Jack T.H. Fenety Research Scholarship or on the Miramichi Salmon Association, you can call the South Esk office at (506) 622-4000. The following outline should be followed when preparing proposals requesting support for research from the Miramichi Salmon Association. Proposals should be presented in a concise manner. All technical terms should be explained. Failure to provide the required details described below may disqualify the application. A concise, one-sentence description of the project. Name, university affiliation, and contact information including mailing address, telephone, fax and email address. Name, title, university affiliation, and contact information including mailing address, telephone, fax and email address. One paragraph non-technical summary of the proposed research including issue, proposed methods and anticipated benefit to achieving the MSA mission. One paragraph describing the knowledge gap to be addressed by the research as it relates to the MSA mission. One paragraph detailing the specific objectives of the research. The objectives should be clear and concise. Describe the location where the research will be conducted. Describe the sampling methods, experimental design, and analysis methods. Identify risks of achieving the research objectives. This section will be used to evaluate research quality. One paragraph describing the expected products including final and financial reports to MSA, expected university theses, publications, etc.Identify how the research data will be secured for the future. Name and describe the collaborators in the research. Indicate whether contributions are secured or requested. Indicate what facilities might be required at the Miramichi Salmon Conservation Centre . Provide a one-page c.v. for each of the graduate student(s) requesting the financial support. Provide a max. two-page c.v. of the research supervisor summarizing the supervisor’s research ability and past performance in supervising graduate level research.